A century ago Arlingtonian Ruth Hornblower moved as a bride to her new home on 84 acres in Belmont whose legacy is a Massachusetts Audubon Society environmental education site — discover its history! To observe Native American Heritage Month, learn how indigenous people thrived in our area for thousands of years, and about the Massachusetts tribe or Ponkapoag’s work today to preserve and share its culture, language, and traditions.  Sunday, January 27, 2019 at 2:00 p.m. Enjoy a special exhibition of objects from the collection either inspired by or made from the natural world. Learn about the connections between fashion and conservation and how mass production often emulated the original natural materials. 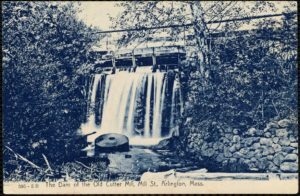 Long-vanished and enduring features of the Mill Brook—once agricultural Arlington’s “industrial spine”—will fascinate us by their variety. The engaging “companion program” to the historical exhibit at The Old Schwamb Mill. From the foothills of the HImalayas, trace the journey of the handsome tulip that came to captivate Holland in the 16th century to the point that it created the economic phenomenon known as “Tulipmania.” Plant history intersecting with human culture is certainly colorful when it comes to the esteemed tulip. The design of its setting has evolved, but the evocative icon still inspires in Arlington’s cherished garden. In 1938, the renowned Olmstead Brothers landscape architects were engaged to re-imagine R. Clipston Sturgis’s 1913 formal design for the “town hall garden” and create a more naturalistic setting for the famed “Menotomy Hunter” statue. Preserving this landscape takes a special multi-focal lens that looks to the past, present, and future. Immortalized in the J. T. Trowbridge novel, “The Tinkham Brothers’ Tide-Mill. 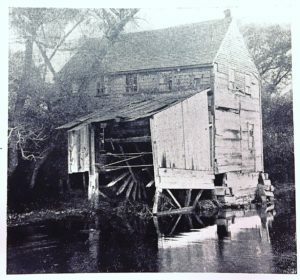 Just one aspect of the fascinating history on the Arlington shores of the Mystic River and Lakes. 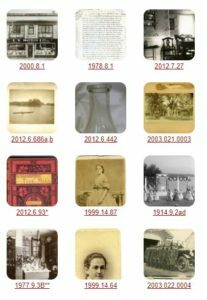 The Mystic River and Lakes have a fascinating history of changes from the pre-Colonial era to the present day. 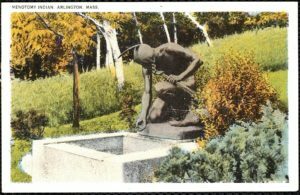 The Arlington sections alone have been the scenes for sustenance, industry, recreation, transportation, and conservation. Video and slides showcase the stories.